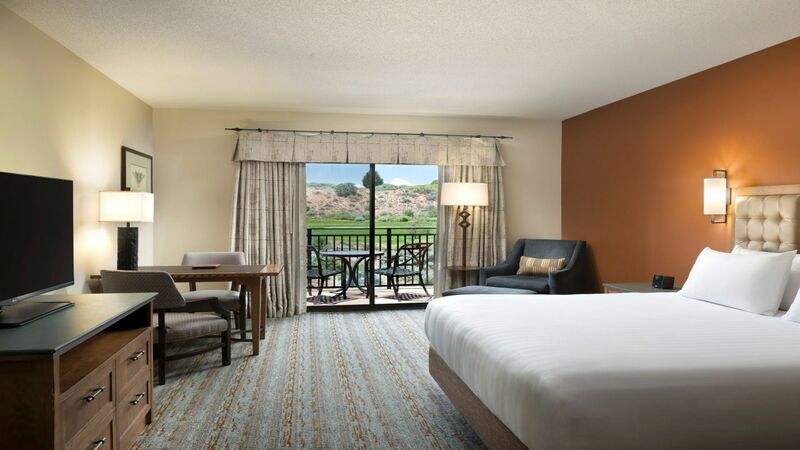 Wake up to breathtaking views of the Sandia Mountains or the Twin Warriors Golf Course from our New Mexico luxury accommodations. All of our rooms and suites showcase traditional designs, created with natural materials and are enhanced with premium amenities, like our plush Hyatt Euro Pillowtop Posturepedic bed, large flat screen TV’s, free Wi-Fi and spacious bathrooms. Indulge in the1,134 sq ft Conference Suite with a parlor, two queen or one king bed, Wi-Fi and a spacious bath. This is a premium suite. See World of Hyatt program terms for upgrade eligibility. 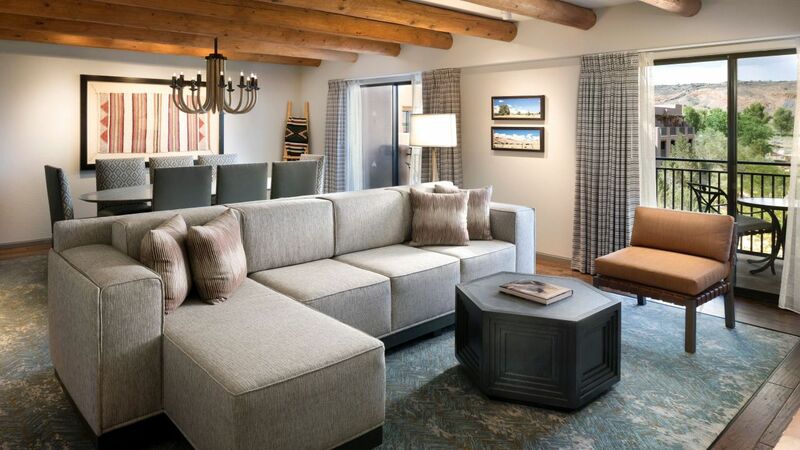 Sit back and relax on one of 3 balconies available in this 756 sq ft suite with one king bed, full dining room table, fireplace, and Jacuzzi tub. This is a premium suite. See World of Hyatt program terms for upgrade eligibility. Relax in the added room of our 754 sq ft Executive Suite with one king bed, and a balcony or patio. This is a premium suite. See World of Hyatt program terms for upgrade eligibility. 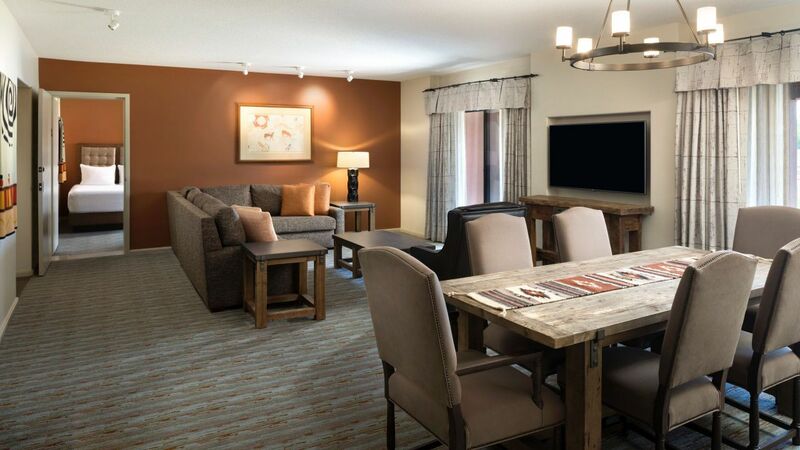 Spread out in our 754 sq ft Junior Suite with two queen or one king bed, Wi-Fi and a balcony or patio. This is a standard suite. See World of Hyatt program terms for upgrade eligibility. 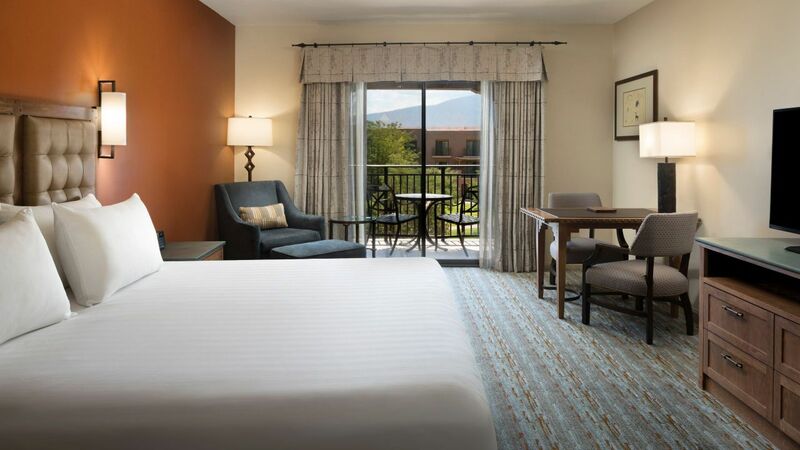 Unwind in our 377 sq ft king room with one Hyatt Grand Bed®, oversized work desk, free Wi-Fi, and full patio. 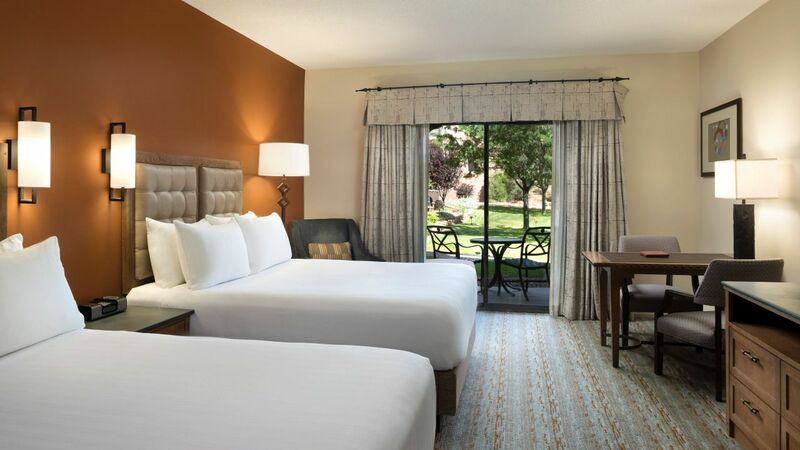 Unwind in our 377 sq ft double room with two queen Hyatt Grand Beds, oversized work desk, free Wi-Fi and full patio. 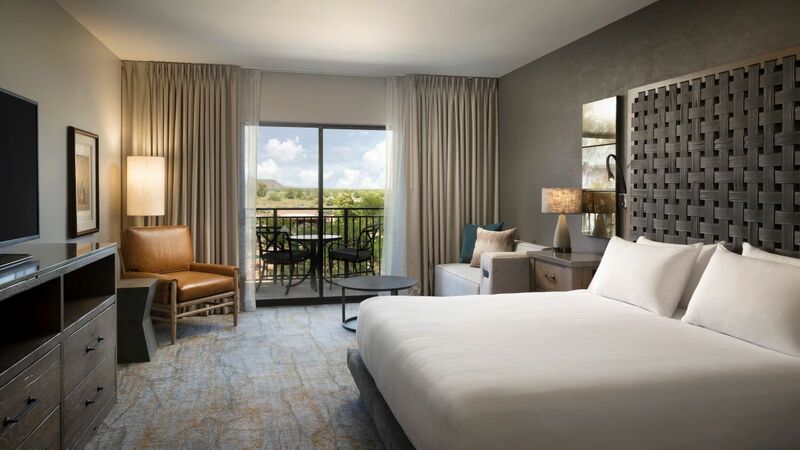 Unwind in our 377 sq ft king room with one Hyatt Grand Bed®, oversized work desk, free Wi-Fi, and full balcony with views of the golf course or pools. 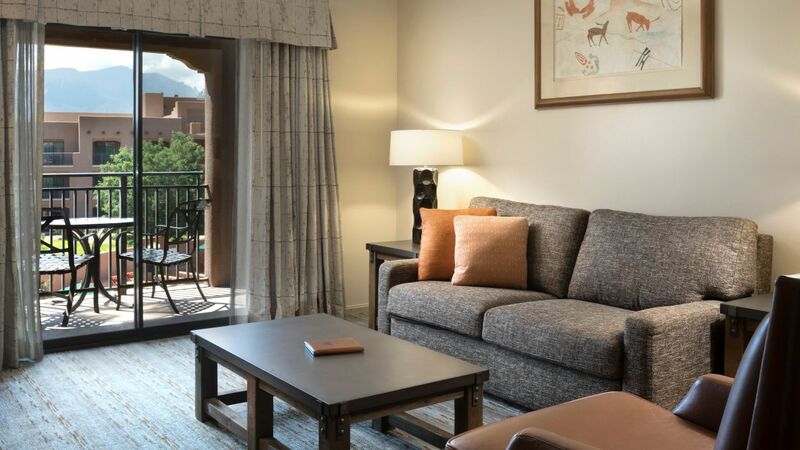 Enjoy the views from a 377 sq ft room with a balcony, two Hyatt Grand Beds™, oversized work desk and a full balcony with views of the golf course or courtyard. 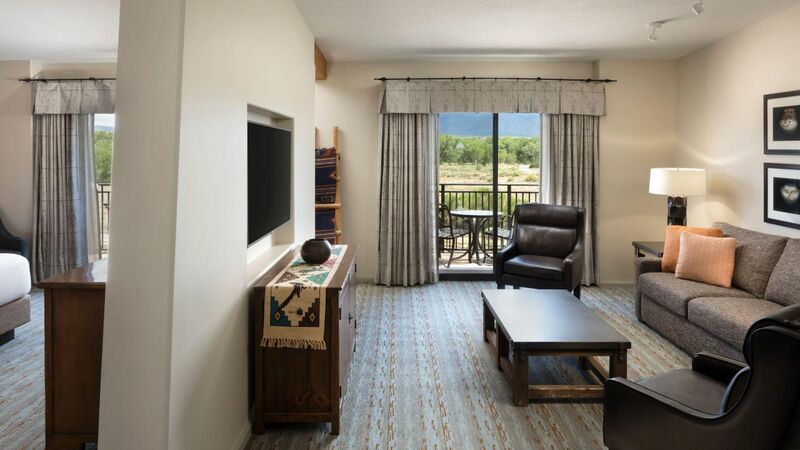 Unwind in a 377 sq ft mountain-view king room with one king Hyatt Grand Bed™, work desk, and sunset views of the Bosque Cottonwood Forest and Sandia Mountains. 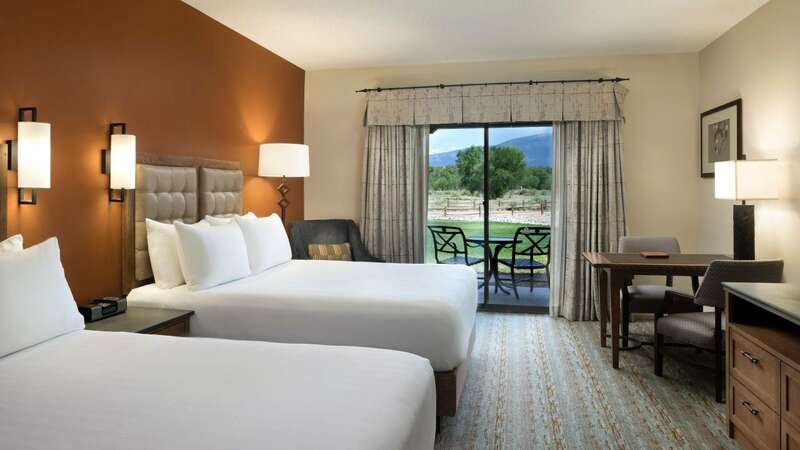 Unwind in our 377 sq ft Mountain View room with two queen Hyatt Grand Beds®, spacious work area and sunset views of the Bosque Cottonwood Forest and Sandia Mountains. 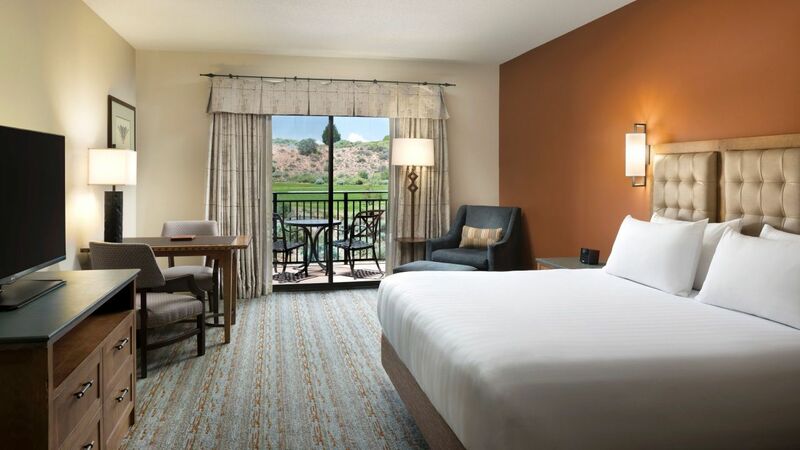 Unwind in our 377 sq ft king room with one Hyatt Grand Bed®, oversized work area and views of the golf course or courtyard. Relax in the 377 sq ft room with one queen and one double bed, oversized work area, and full balcony with views of the golf course or courtyard. Unwind in our 377 sq ft room with two queen Hyatt Grand Beds®, oversized work desk and views of the golf course or courtyard. This 377 sq ft accessible tub king room features one Hyatt Grand Bed™, oversized work area, close-captioned 47” flat screen TV and free W-Fi. Unwind in this 377 sq ft accessible tub, double room with two Hyatt Grand Beds™, work desk with lamp, close-captioned 47” flat screen TV and free W-Fi. This 377 sq ft accessible shower king room features our Hyatt Grand Bed™, oversized work area, close-captioned 47” flat screen TV and complimentary W-Fi. Unwind in this 377 sq ft accessible shower, double room with Hyatt Grand Beds™, oversized desk with lamp, close-captioned 47” flat screen TV and free W-Fi.